Back-to-school means back-to-busy for many families. How quickly we change the pace of our daily lives from the less-structured summer to the quite often overscheduled school year. Mornings can be rushed, school days are tiring and the afternoons and evenings are filled with practices, try-outs, meetings, and hopefully the occasional shared meal around the kitchen table. And we haven’t even mentioned homework yet! We’re all in for anything that helps with homework. Our September craft is both whimsical and functional. Not only do our crafts allow kids to work with their hands and get their creative juices flowing, they mix up the routine of the therapy session. Clinicians often remark that our craft projects bring out different aspects of a child’s personality and frequently spark interesting conversations. 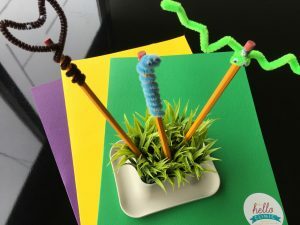 This month, kids get to make pencil toppers with pipe cleaners and googly eyes. The possibilities are endless: friendly monsters, bugs, antlers, snakes, worms! We hope that the fresh and fun pencil topper will help your child finish their homework with minimum drama! Going back to school is a great time to get organized. Just like at school, we have a stash of colorful pocket folders on hand for keeping all your speech or OT homework in one place. We don’t hand out tons of homework, but when we do send home worksheets, it helps to keep them in a handy folder so that you can bring it back and let us know what went well, and what to keep working on. Your child could also bring it to their school SLP to show what they are working on at our clinic. Accessing School-Based Services? We can help. Is your child also getting speech or OT services at school? Our clinicians are always happy to connect and collaborate with the other specialists working with your child. As long as we have your permission, we’ll speak with any teachers or other members of your child’s special education team (or medical providers). If you need assistance navigating the special education process or understanding the roles of those on your child’s special education team, we’re always glad to help. It is our belief that services should wrap around your child, supporting in whatever way we can for him or her to be successful. We are here for you every day. That may mean a friendly little goggly eyed pencil topper to make homework more fun. A dedicated clinic folder for organizing the speech or OT homework that accelerates the work we do in our therapy. And a spirit of collaboration when it comes to coordinating care around your child’s therapy.